To floss or not to floss? That is the question. Some people will floss as many as three times a day, while others will never floss, period. Others may floss only after eating foods like corn on the cob, while some people will floss for a few weeks after their dental checkup, and then abandon flossing until their next visit. As you can see, the amount of flossing varies greatly from person to person. Here, we will help you decide how often you should floss, as well as learn about some other benefits of flossing. The American Academy of Periodontology released a report claiming that flossing was actually beneficial to oral health as well as overall health. They claimed that while the current amount of evidence on the benefits of flossing was minimal, patients should continue to floss as part of their oral hygiene routine. Furthermore, the American Dental Association also responded 2 days later with their own report, claiming that interdental cleaners actually play an essential role in taking care of both gums and teeth as well. When you floss your teeth you are actually removing malevolent bacteria and food gunk trapped along your gum line, as well as between your teeth. If you opt not to floss because you don’t know how or simply don’t feel like it, then the harmful bacteria and food particles will lead to more bacteria accumulation. This leads to plaque, which is a colourless and sticky film that can lead to gingivitis and tooth decay. In other words, failure to floss over the long term will adversely impact your oral health as well as your overall health. As for gingivitis, it is considered the first stage of gum disease. At this stage, flossing, deep cleanings, and visiting your dentist regularly can help reverse the harmful effects of gingivitis. However, if left unchecked, gingivitis will rapidly turn into periodontitis, which is full-blown gum disease. While gingivitis leads to gum inflammation, periodontitis is even more devastating, as it will also lead to bone loss as well. Bone loss, in turn, will lead to tooth loss, so if you value your teeth and don’t want to have implants or dentures put in, which will cost tens of thousands of dollars, then flossing regularly will help nip any problems in the bud before they mutate into something far more serious. Most dentists agree that people should floss after they brush their teeth. You should floss at least twice a day; before breakfast and before going to bed. However, if you brush three times a day, such as after each meal, then you can floss three times a day if you wish. By brushing and flossing after each meal you will remove any bacteria and food particles that have accumulated between your teeth. If you hate flossing then most dentists, as well as the American Academy of Periodontology and the American Dental Association, recommend that your floss at least once per day, ideally before going to bed. You should also use mouthwash to help remove any harmful bacteria that you may have left behind due to improper or insufficient flossing. You can floss several times a day but if you don’t use the proper technique then flossing is pointless. For instance, many people will simply slide the floss into the gap between their teeth and move it up and down. When you do this you often fail to clean both teeth equally. To properly clean your teeth you will need at least eighteen inches of floss. This will ensure that you have sufficient clean floss to get between all of your teeth. First, tie the floss around both of your middle fingers and pinch the floss with your thumbs. Then, ensure that the distance between your two hands is kept to a minimum, and gently run the floss between your teeth. In order to clean both teeth evenly, you will need to make a “C” shape with the floss. That is, you will need to hug one tooth with the floss and slide it up and down and then form a “C” shape around the adjacent tooth and slide the floss up and down again. The back sides of your last teeth should also not be forgotten. Also, make sure that you are using a gentle motion whenever you floss, as rough flossing will cause your gums to bleed profusely, which may deter you from flossing in the future. On a final note, if you simply cannot or don’t want to floss using traditional floss then there are other options available to you. For instance, you can use soft-picks to remove bacteria, plaque, and other particles from between your teeth and along the gumline. Please speak to your dentist to determine which option is best for you. 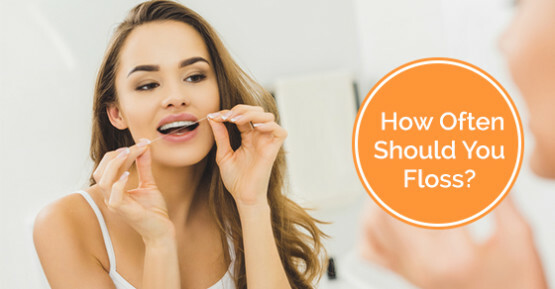 Flossing is a very important part of one’s oral hygiene and can help reduce the risk of heart disease, cavities, tooth loss, as well as reduce halitosis and a bevy of other health problems. If you would like to learn more about how to floss, or how often you should floss, then call Roots on Whyte Dental at 1-888-396-4932 or contact us here.